"If you are looking for a super healthy dish that has robust flavor and leaves your guests feeling full without guilt, this is a great accompaniment to any meal or can stand on its own as a vegetarian dish. It is vegetarian, gluten- and dairy-free." 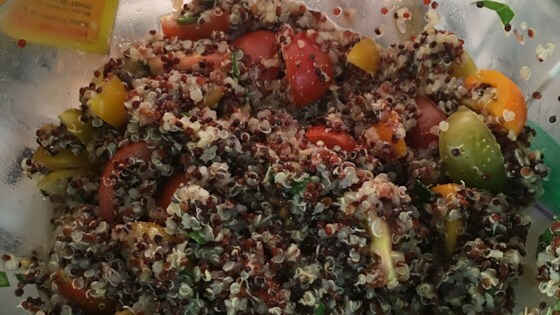 See how to make a quinoa salad loaded with fresh Mediterranean flavors. If available, make this dish with equal parts red and white quinoa. I didn't have eggplant so I just used heirloom tomatoes. I added a little olive oil for flavor. Love the lemon! Added lemon zest too.